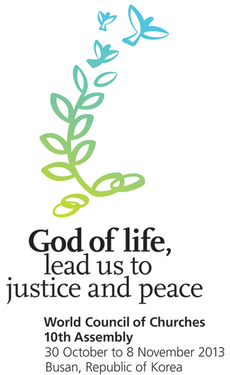 A set of songs inspired by the assembly theme: "God of life, lead us to justice and peace". They can be used in worship and prayer as well as in other meetings during the whole church year. In anticipation of the WCC 10th Assembly, two composition workshops have been held in 2012. Musicians from Asia, the Americas, Europe and the Middle East have contributed their talents to the songs, which are now available on this site. You are encouraged to use them freely, but please respect their Creative Commons License. Click here to access the music sheets for the songs in the video. The songs below were composed at a workshop organized by the World Council of Churches and Red Crearte in Mexico. Scores include lyrics in English and Spanish. These resources were created at a workshop in Mexico, 7-12 February 2012 organized jointly by the WCC and RedCreate. Participants and authors: David Brondos, Roberto Chávez, Mendelson Dávila Amaya, Loida Gáffaro, Karina García Carmona, Dan González Ortega, Elizabeth Hernández-Carrillo, Louis Marcelo Illenseer, Tercio Junker, Simei Monteiro, Gerardo Oberman, Margarita Ouwerkerk, Joel Elí Padrón Ibañez, Edgar Quintero, Ruth Schneider, Eleazar Torreglosa, Jeremías Escalante Velázquez, Horacio Vivares. English translations: John Thornburg with the help of Dr Roberto Escamilla; except ”Huapango del pan” by Andrew Donaldson. The songs are licensed under the Creative Commons Attribution Share Alike (by-sa) License. Developed for use at the 10th Assembly of the World Council of Churches. Individuals and congregations are welcome to explore this unique resource in their liturgical accompaniment of the assembly and its theme. Congregational and performance uses may require further permission from the authors and composers. See detailed acknowledgments and copyright information at the back of the volume.